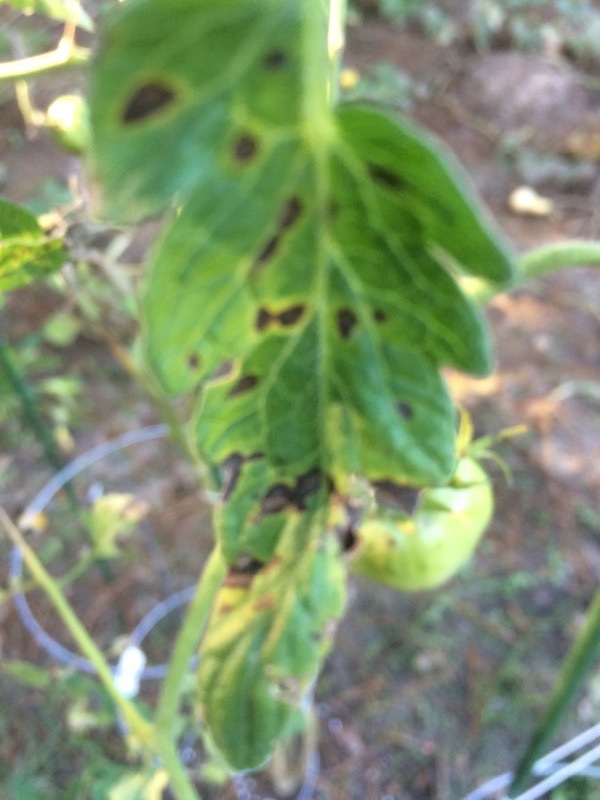 Your tomato appears to have one of the blight diseases that plague tomatoes. If the disease is not too extensive, clip off the diseased leaves and stems, pick up any fallen leaves and dispose all in the trash, not the compost pile. Spray or dust the plants to arrest the disease and control the insects often accompany it to stressed plants. Visit a garden center for fungicides and insecticides from organic sources and follow label directions. Water at the base of the plant, not overhead and foliar feed with a liquid kelp to possibly help revitalize the plant. Blight effects lower leaves first, then may spread upwards if not controlled. Mulch around the base of the plants plus removing some of the lower leaves can help control the blight that washes up from the soil onto plants. 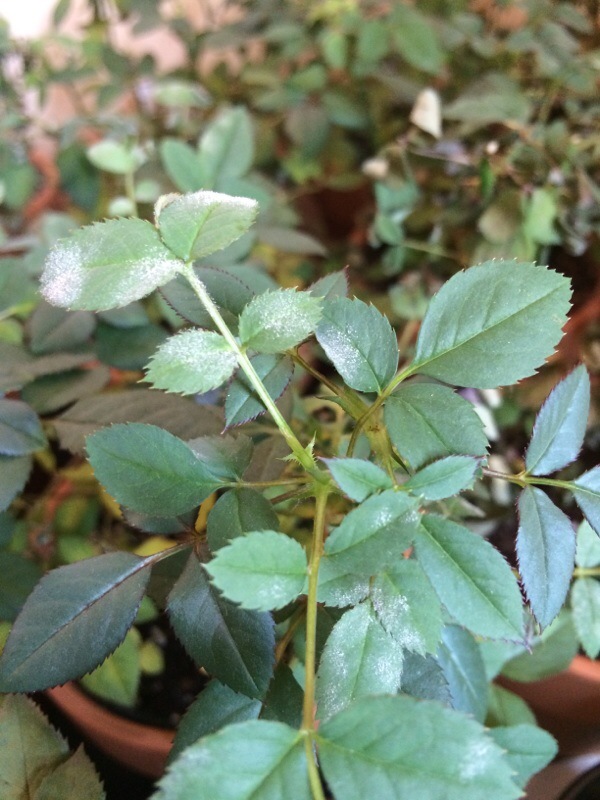 This is a fungal disease called Powdery Mildew; one of the most common diseases of roses, peonies, phlox (and many other plants). Moderate temperatures of 60° to 80°F and shady conditions are the most favorable for powdery mildew development, and will spread. The fungal spores are spread by wind. The good news is, you can manage this disease; sometimes fungicides are needed. Actinovate and Neem oil are two organic products that can help you with eliminating the fungus. Be sure to pick up any leaves and throw them out - do not put them in the compost pile. Also - do not water the leaves. Only water at the base of the plant. Do your best this year to save the plant, and if next year is more favorable the situation should be better. This could well be verticillium wilt, which unfortunately attacks lilac trees, although rarely. It's caused by a soil inhabiting fungus which clogs the plants vascular system. Wood under the bark may exhibit discolored streaks or bands. Confirmed ID is only possible through laboratory tests. There is no chemical cure. 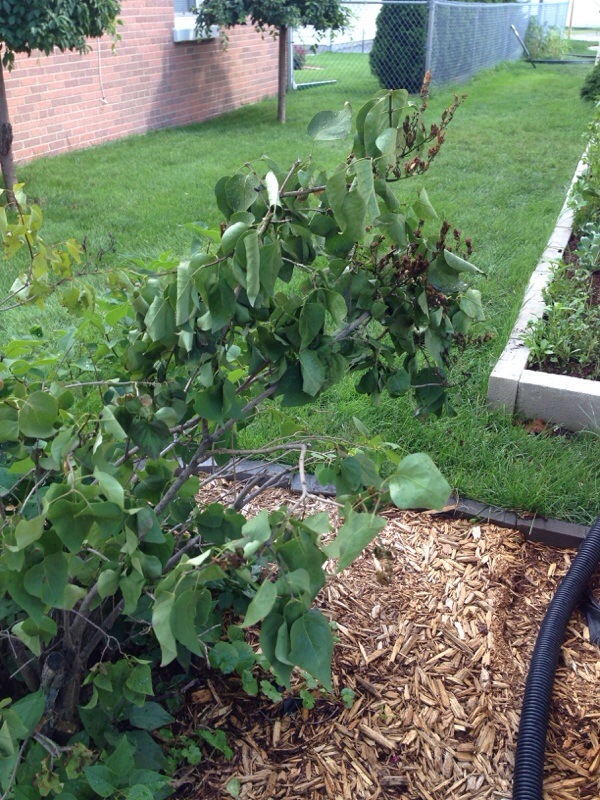 Infected trees should be watered throughout the growing season. High nitrogen fertilizers increase wilt severity; applying a 10-10-10 may help. 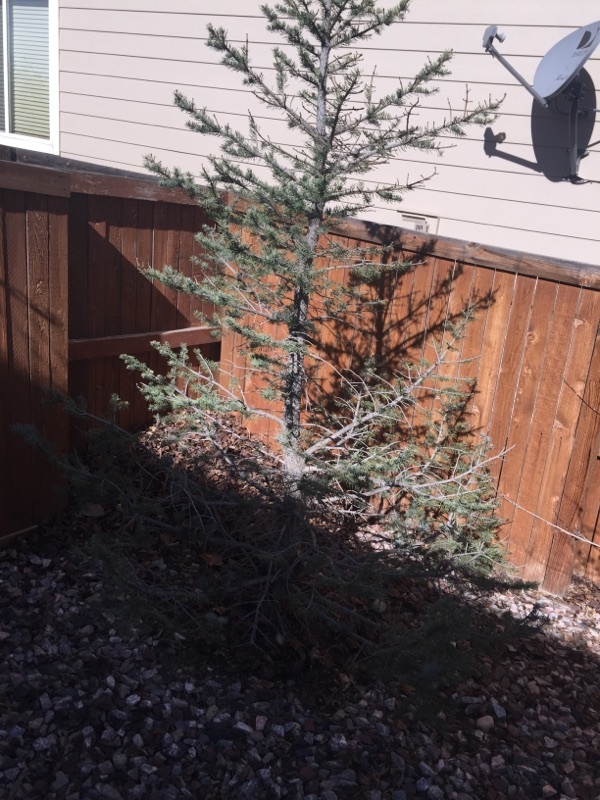 Remove all dead branches, pruning back to wood showing no streaking. If you replace your tree, choose a species that's not subject to verticillium. Particularly susceptible plants—ones to avoid—include maples, smoke bush, sumac, barberry, Catalpa, redbud, and roses. This appears to be a case of powdery mildew. Powdery mildew is unattractive Although plants are unsightly and can be weakened by an infection, they do not usually die. 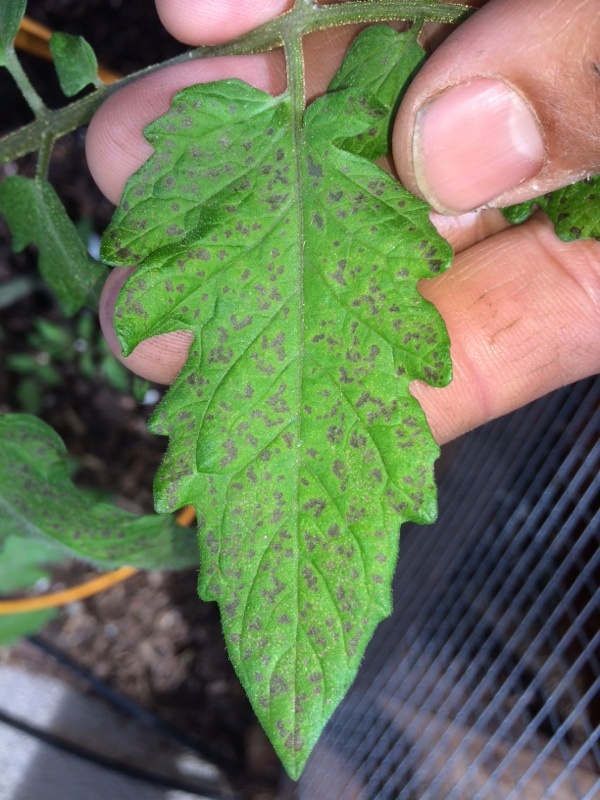 Powdery mildew on ornamentals is an aesthetic issue. Powdery mildew can be prevented, and it can be controlled once it appears, but it can't be cured. 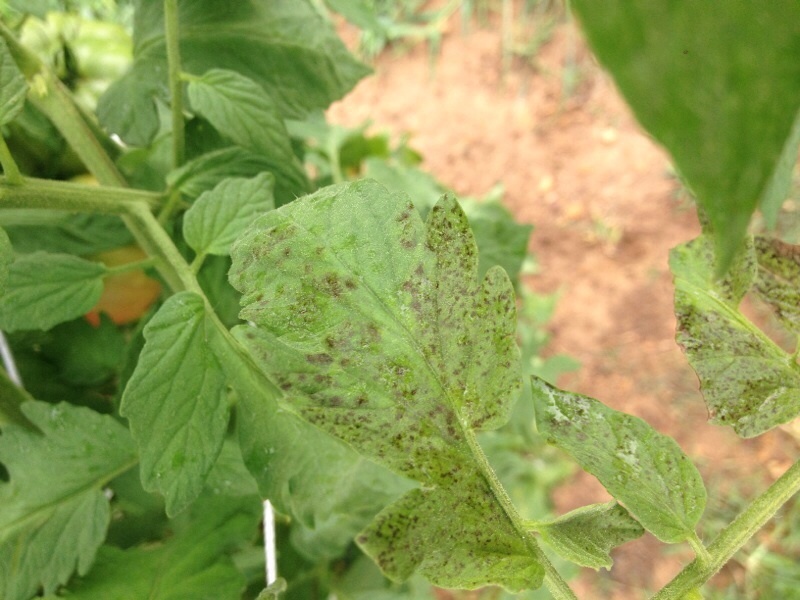 The key to preventing it is planting mildew-resistant or mildew- tolerant varieties. Resistant varieties get less mildew than susceptible varieties; tolerant varieties may get some mildew, but it shouldn't affect the performance of the plant. Prevention also includes siting plants where they will have good air circulation. To control minor infestations, pick off affected plant parts and bag them tightly and put them in the trash. The leaves may have suffered some fertilizer burn from the fertilizer or they could be dying back because of the excessive moisture. I would remove some of the dead and dying leaves and try not to keep the soil overly moist when watering. You may want to repot the plant at some time to put in some rough compost, shredded bark or something like that to increase drainage if the soil stays wet all the time. You want the soil moist but not sodden wet. If either of these problems are causing the leaf die back they should be temporary. The fertilizer should eventually wash out and if you let the soil dry some the leaves may gain a better condition. If neither of these work you may wish to consult with your local county Ag extension agent regarding problems with raspberries. 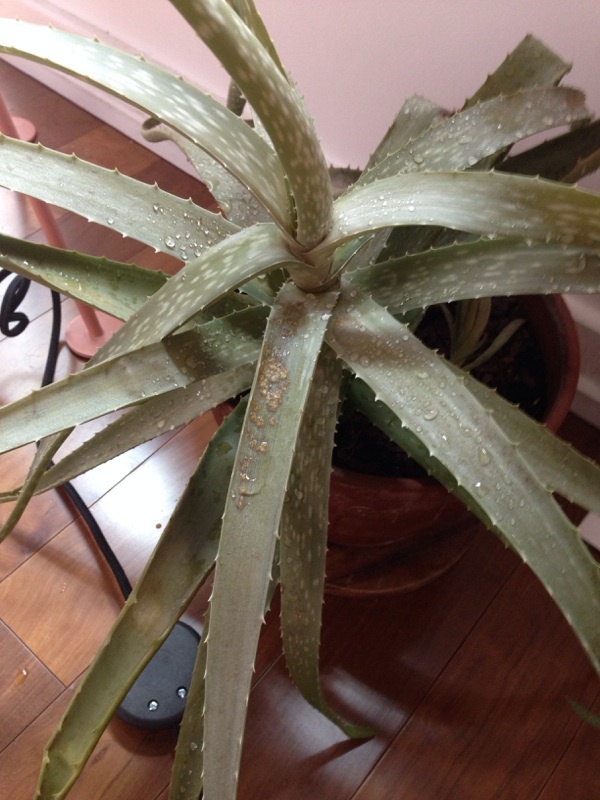 Your aloe should do fine outdoors as long as it doesn't freeze. Moving into the sun is a good thing and they rarely have that bright green color when grown outdoors. In fact in full sun they usually take on kind of a bronzey-pink cast to them. They will also grow in a much tighter rosette with the leaves more upright rather than splayed out the way they look now. I would suggest making the move to full sun gradually, starting with filtered sun so as to not possibly burn it due to its tender "indoors" skin. The only other thing I can offer is that when you water it, do it thoroughly, but don't water again until the soil has become some what dry first, say a couple of inches down in the pot. The easiest thing to do is just stick your finger in and give a feel. This appears to be a fir tree, but without a close-up of the needles, we can't be sure. Firs have needles that are flat and flexible, and not overly sharp. Spruces look much the same, but their needles are square and painfully sharp. Your tree's failure to thrive could be due to a number of factors. What's under the gravel? If there's plastic, it could be blocking air and water from the soil. Both firs and spruces appreciate a cool spot and extra irrigation at lower elevations. The reflected heat from the rocks could pose a problem. The roots should extend at least twice the distance past the edge of the foliage as from the trunk to the edge of the tree. Do you irrigate in that area? Has the soil been improved, and do you ever feed the tree? This looks like its probably a leaf spot disease, either Bacterial or fungal Septoria leaf spot; both of them are spread by splashing water on leaves. 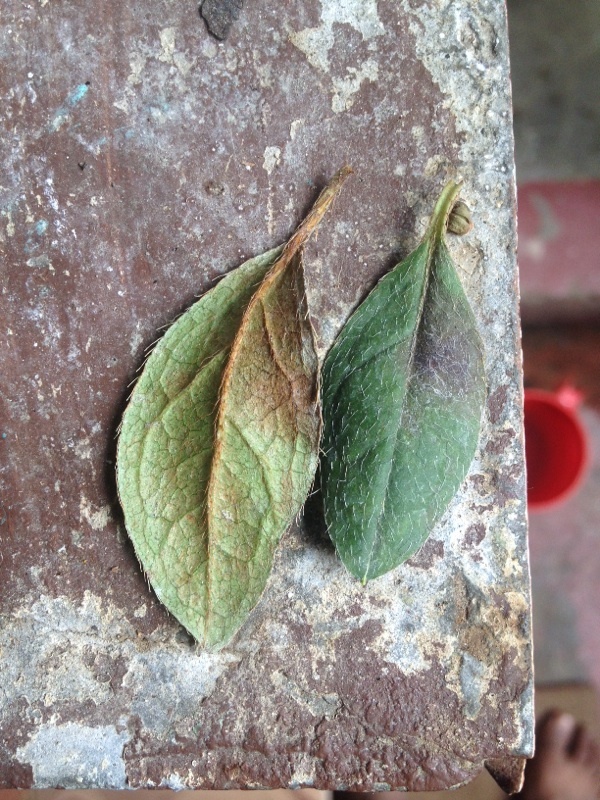 We've included some web links about them for your reference, but the only way to ID plant disease for certain is to have a pathologist test the tissue. You can take samples of all affected plant parts (sealed in a bag) to your local Dept of Agriculture office and they will reply to you by mail. 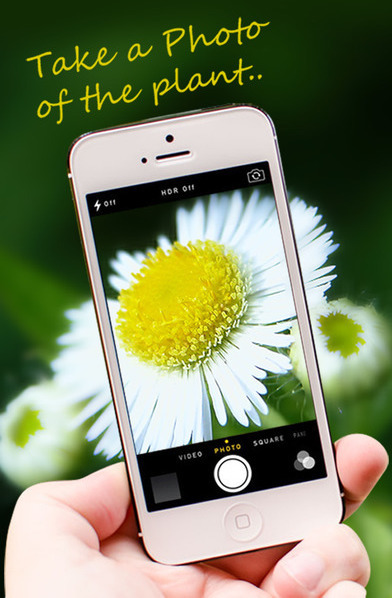 Provide them with as much info about the plant environment as possible. In the meantime, you may choose to remove the most affected leaves, and we recommend you review the info provided in the weblink about caring for tomato plants. We're not absolutely positive on this so we're double checking with a tomato specialist. Will get back to you if we find out more. 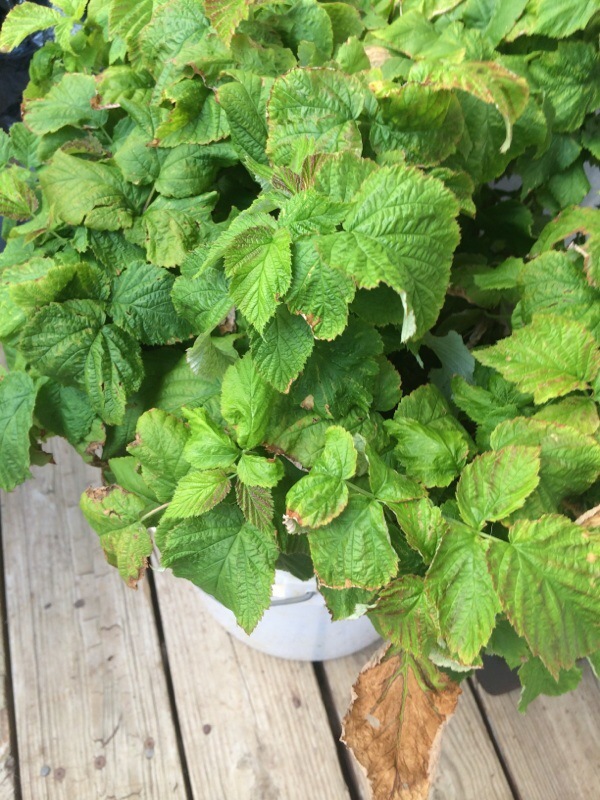 This might be bacterial spot, a disease that affects foliage in humid, wet growing seasons. It starts on the edge of the leaf, turns it white and then brown, and spreads inward, usually on new growth. To minimize spread, water early in the day with drip irrigation. Overhead watering may spread the disease by splashing pathogens. If disease is not extensive, snip off affected foliage and dispose in the trash. When more leaves are affected, cut off as much of the damage as you can and place the pots farther apart. The disease can spread on clippers and other tools, so prepare a solution of 1:10 bleach:water and dip your clipper in it between plants. 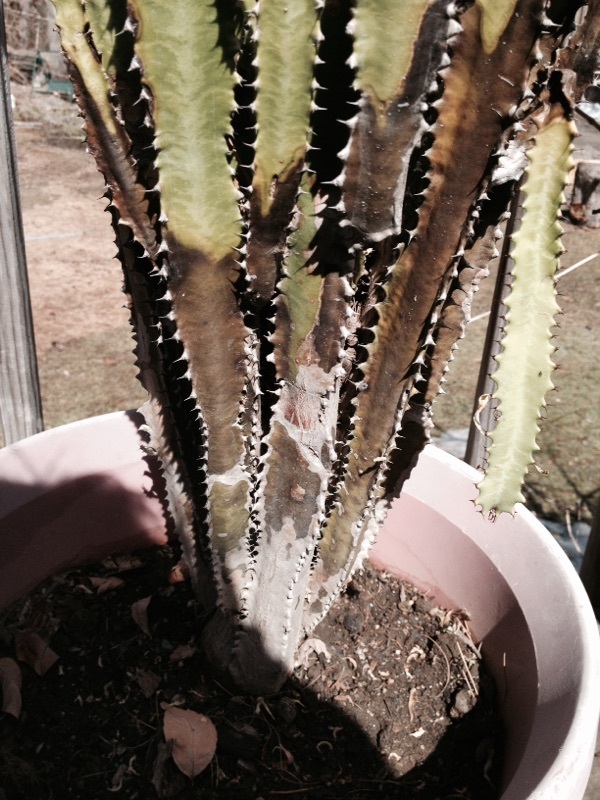 This could be either a bacterial or fungal infection, not uncommon with cactus. This is very hard to treat and may be the demise of the plant. Since it is traveling from the bottom up, we suspect the roots of your cactus have already rotted, and it is just a matter of time for the rest of the plant to catch up. If you want to try to save it, follow the directions for potted canvas here: http://homeguides.sfgate.com/repair-cactus-root-rot-68177.html The rot you see here is caused by overwatering, possibly combined with a soil mix that is not porous enough--it should feel gritty when you rub some between your fingers. Also, there should never be any water left in the bottom of the saucer, as this will keep the soil soggy. We're sorry we couldn't give you good news.